Part of a bundle of cheap DVDs from my local HMV store, I chose Momo as the first of them to watch (and also as it was one of the few child-friendly ones I could share with my son). This is a 2011 theatrical anime release directed by Hiroyuki Okiura, whose most prominent previous directorial work was the tonally opposite Jin-Roh – The Wolf Brigade, also produced (as was Momo) by Production IG. 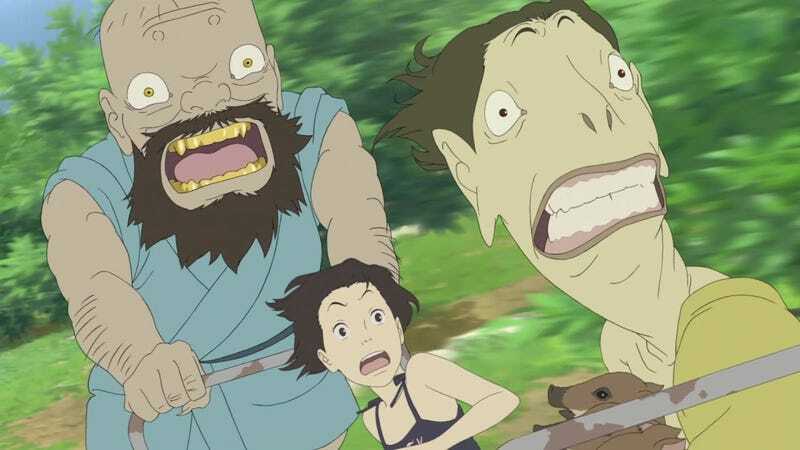 Whereas Jin-Roh dealt with military violence and paranoia, Momo is a gentler film with both humorous and melancholy touches that explores the effect of grief primarily upon a daughter bereaved of her father, and to a lesser extent her widowed mother. As befits a film about death, there is some examination of cultural beliefs and practices in the film that may appear quite alien to a western audience unfamiliar with Japanese folk religion (Shinto). The main character Momo is a shy, even socially inept 11-year-old girl who, after her father dies, reluctantly moves with her mother to her family home on an island in the Seto Inland Sea, a body of seawater that separates Honshu, Shikoku and Kyushu, three of Japan’s four main islands. She makes no secret of her disappointment and resentment at moving to this remote part of Japan and for much of the film shuns the friendship of the other children she meets. At times she presents as both bratty and inscrutable, though this gives her a rounded character. I found myself anxious that the other children would turn on this standoffish girl, but to their (perhaps improbable) credit they shrug off her behaviour and don’t deliberately exclude her from future social opportunities, like I suspect real children would have done. Momo’s expressions and body language are very well animated, she is a convincing portrait of a proto-adolescent, all self-consciousness and disdain for the adults around her plus believable terror at her supernatural experiences. Once past the fairly slow start to the film, Momo meets the main drivers of the plot – the supernatural creatures Iwa, Mame and Kawa who take the form of three Yokai from her grandfather’s old picture book. They reminded me of the aliens from Lilo and Stitch – Iwa, the larger, overbearing (but ultimately friendly) character like Dr Jumba, Kawa the taller, green-tinged and slightly sneaky character like Agent Pleakley and the diminutive Mame like a more forgetful, less unintentionally violent version of Stitch. Whether this 2002 Disney movie had any influence on the development of Momo I don’t know. These Yokai bring a chaotic energy to an otherwise leisurely-paced film. Their actions are almost entirely self-serving despite their apparent roles as Momo’s guardians, and their idiotic pratfalls cause most of the problems and conflict. Your tolerance for slapstick and therefore enjoyment of their antics may vary. I found them pretty annoying, though at times they were endearing, especially toward the end of the movie where although they never quite transcend their selfish desires, at least they act with concern towards Momo’s needs and fix the mess they made. As expected of a movie from Production IG, this looks pretty good with some high quality if not mind-blowing animation. The island has a lived in, rural appeal with some nice convincing details. The motorised lift for transport between terraced fields was a particularly interesting touch – I’ve never seen anything like that in real life, but I imagine it must be real. It’s involved in a particularly humorous scene involving baby wild boars (and very angry wild boar parents) that showcases the mountainous island settling. I don’t know enough about traditional Japanese beliefs to know whether some of the concepts of death and the afterlife explored in the film are mainstream. The concept that the souls of the dead wander the earth for a time, only later to ascend to Heaven was interesting, and it was because of this concept that the Yokai were needed as temporary family guardians at all. Once Momo’s father ascended to Heaven, they would no longer be needed. Certainly Shinto venerates ancestors, who are thought of as looking down from Heaven on their families after their deaths. Overall this was a enjoyable enough movie, but probably not one that will leave a lasting impression on me. My 8-year-old son’s attention wandered at several points, the editing could certainly be snappier. It’s more suitable for an older child or adolescent. The English dub is fine, though some of the Japanese terms have not been accurately translated. (Yokai are NOT goblins!) Seek it out if you enjoy melancholy films with splashes of absurd humour.